Born in the Philippines, Elle kept a deep connection to his culture while growing up in the U.S. After exploring various avenues of art and cultural expression, Elle co-founded Tatak Ng Apat Na Alon (Mark of the Four Waves) Tribe in 1998; an international organization with the purpose of reviving Traditional Filipino Tattoo culture. Inspired by the power of the revival, Elle began tattooing using traditional methods in 2003. After practicing hand tapping and hand poke for years, he began working with a machine in 2012. Known for his tribal artwork and detailed fine line, Blackwork, Elle has made a name for himself within the Traditional Tattoo community. 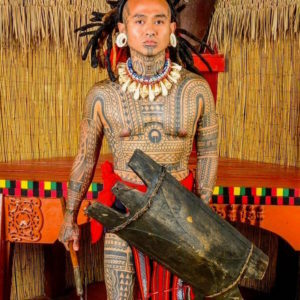 After studying indigenous tattoo from around the world, his focus is on keeping culture and traditions alive through art and tattoo.